What happens in Órgiva is pretty much the same as the UK and Ireland. Most things close on Christmas Day and New Year’s Day. We’ve yet to experience a Spanish Christmas and will do a post about Spain’s customs at this time of the year in the next day or so. 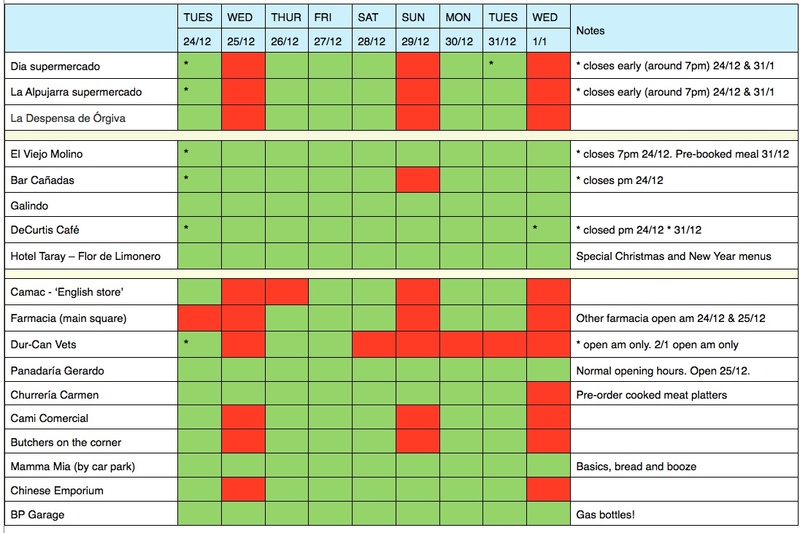 In the meantime, here’s our guide to what’s open over Christmas. It’s not a definitive guide but may help those itching to escape after an argument over the cranberry sauce, or who are faced with a disaster. For example, if your oven explodes, Churrería Carmen opposite the church is open for ready-cooked chickens on Christmas Day. Several places are doing special set meals – like Flor de Limonero at Hotel Taray and Molinos. And if you run out of gas, the BP garage is open every day. For locations, here are maps for shops, supermarkets and some of the bars mentioned. If you know about the opening times of other places, please let us know. Gosh, I thought coloured grids like these were squarely in the domain of the Germans, but clearly, I was wrong. This is all that’s to be said about Christmas in Spain: It goes on for bloody ever. Till the 6th of Jan. Truncation not an option. Sigh. AND camels, don’t forget. Gotta put water out for those. I’ve got a water leak dripping into my spare bedroom. I’ve collected three bucketfuls already. You better get yer skates on!